Original Gispen tubular chair model 1235 with bakelite armrests designed by the Design Design Bureau NV Gispen in 1960. 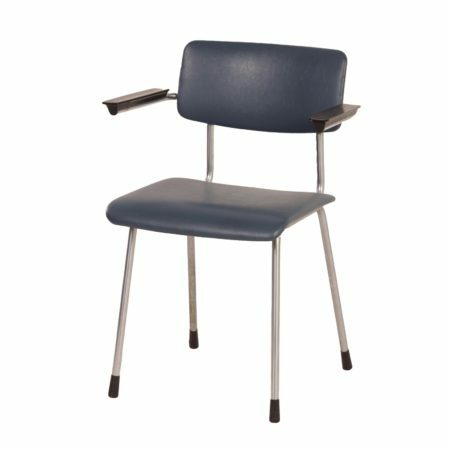 The frame is made of chromed steel tube and the seat and back are made of wood, covered with foam and the original blue artificial leather. The armrests are made of bakelite. The frame forms a handle at the rear of the backrest. Considering the age in very good condition, no damage to the upholstery. Source: book Collection Gispen, NAI publishers, page 132. Marked: TU Delft.